Though many families believe that cats are low-maintenance pets, the reality is that cats have just as many health concerns as humans. They need regular checkups, vaccinations, and even dental care to keep their teeth healthy. Whether you're a first-time kitten owner or a veteran cat caretaker, it's worth your time to invest in professional care from a feline veterinarian in Scarborough, Maine. Turn to Cats On Call Hospital Inc, a cat hospital, for comprehensive cat care. As a cat owner, you may be familiar with the challenges of bringing your pet to an all-animals veterinary office. Dogs, birds, and the occasional exotic pet can make your kitty feel anxious and aggressive. At our exclusive feline care clinic, you'll enjoy care from a cat-only vet in a feline-only setting, making it easier to bring your pet in for regular care. If you feel that your cats would be more comfortable having our cat- whispering team come to them, then please request one of our convenient house calls. Let us make you and your cat more comfortable. Your cat's well-being is our number one priority, and it is our goal to make sure it is as happy and healthy as possible. Because our cat hospital strives to stay up to date with the latest advances feline care, we're able to treat your cat with industry-trusted techniques and treatments. Turn to us for reliable care, even on a budget. Dr. Hoyt is a cat-only vet with more than 21 years of experience in feline medical care. 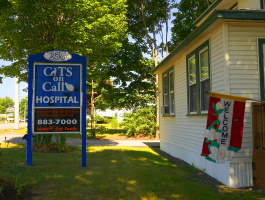 Due to popular demand, she established her veterinary practice with the mission of offering reliable, compassionate care for cats in both home and office environments. The human and animal bond is an important part of our job, and it is our personal mission to provide personal and affordable services when you and your pet need them the most. "Smokey has always received the most compassionate care at Cats On Call (as did our Oska before him.) Dr. Kris Hoyt and her staff are truly wonderful with cats - as they should be, of course - but we feel they go above and beyond what is necessary in caring for our pets. Smokey has never been stressed out there because they stroke him, and talk to him and he knows that he is in capable and loving hands. I wish all felines could get the level of care that you offer." I highly recommend Cats On Call. "This hospital and staff are superior ! Not only are they knowledgeable, but they are very compassionate. They cheerfully go the extra mile to make things easier on you and your pet. They even do house calls! ... Not many vets do that anymore. My cat had been diagnosed with kidney failure, but thanks to the excellent care my cat received she is not only alive,but thriving!... And it has been two years! I highly recommend Cats On Call. " "Very very nice vet - Dr. Hoyt. Other vets work there as well. They really care - kinda like Dr. Looby (See my review of Looby in Medford, MA). They're very aware of alternative modalities, and have a good handle on what makes kitties tick (and what impedes them). Highly recommended. I have also gone to Brackett St. Vet. They are good, but the vet I prefer there seems to have left. My cat has LOTS of health issues, so I decided on a cat-focused vet." This practice loves the animals they help. "I have been taking my cats here forever! Every cat, whether healthy and only needing a check up and shots, or for instance Ollie who was bitten at the base of her tail and had an abscess that Dr. Hoyt drained, the care was professional and immediate. The staff are experienced and have worked with me as I have had kittens become aged, blind, or suffering from kidney failure. This practice loves the animals they help."